This page provides various information about the memory of the Atari computers. Some of information comes from my Atari FAQ and it is possible to find additional information on the FAQ about the memory for the falcon and the extension beyond 4Mo. This paragraph gives general information on expanding memory of Atari computers equipped with SIMM modules, the different memory configurations, and some advice on their installation. In order to help in the identification of the memories modules a paragraph is devoted to old memories modules. 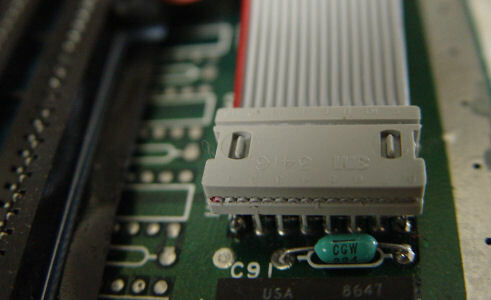 To install the SIMM memories it is necessary to reach the memory connectors and to remove the existing modules. The 520/1040 STE Atari's models are equipped with SIMM memory sockets and it is therefore possible to easily increase the capacity of the memory up to 4MB. Although the information presented here have been validated on Atari STE models it should equally apply to any Atari's models equipped with SIMM connectors (e.g. Mega models). Be also aware that some very early STE models were equipped with SIP modules which are extremely difficult to find and not covered in this presentation. The Atari STE models have four SIMM memory sockets numbered from 1 to 4 (going from back to front of the system). These sockets are specifically designed to ensure that once inserted, the SIMM will be held in place tightly. The Atari STE models only accept the SIMM 30 pins / 8 Bits memory modules with or without parity bits and with a capacity of 256KB or 1MB exclusively (i.e. do not try 2MB, 4MB, 8MB, 16MB modules). The minimum speed for SIMM modules is of 150ns for the 256KB and 120ns for the 1MB. It is generally easy, and perfectly appropriate, to find 256KB modules at 120ns and 1MB modules at 100ns or 80ns. For information the fastest SIMM 30 modules are running at 60ns and they use memories are of FPM type (Fast Page asynchronous Mode) which are faster than the normal DRAM. The original SIMM modules used in Atari were not of EDO type but as for parity it should not matter. It is recommended not to mix SIMMs modules with different speeds on the same machine as it usually does not work reliably. And if you need to buy SIMM modules for your Atari make sure you buy SIMM 30 which should not be confused with the SIMM 72 used in the PCs. The SIMM 30 modules have a 30 pins connector with gold or tin/lead contacts, a hole on each side (this is to ensure that the module is well inserted before tilting it), and a notch on the left (this ensure that the module is not inserted backward). The PCB has 30 pins on each side but the corresponding pins on these two sides are connected together. The size of the data bus on the SIMM 30 is 8 bits with possibly one 9th bit for parity (not used in Atari). As the data bus of Atari is 16bits wide that explains why the memories must always be installed in pair. The pinout and the names of signals on SIMM 30 are indicated in the table below. The installation of news memories requires to remove the plastic cover of the computer, as well asto remove the metal-shield that covers the power supply and memory, but it is not necessary to disconnect the keyboard (although it is more practical). You first have to remove the existing memory. To remove a SIMM module, the two plastic clips at each end must be pulled to the side, then the module must be tilted back and pulled out. It is important to gently release the socket clips one at time. This might be best accomplished with a small flat blade screwdriver. Be aware that is easy to break the clip if too much pressure is applied and that If you break the clips, the SIMM module will not be properly held. The installation of the memories is extremely simple. You have to insert the SIMM modules (with the notch located on the right i.e. with the memory components located in the back of the board) in the socket at an angle of approximately 45° with the vertical. Once the module is fully engaged at the bottom of the socket you have to tilt it upwards until they are perpendicular to the motherboard. Special plastic clips on both side of the sockets snap in place when the SIMM is in its upright position. Normally it is impossible to install SIMM modules incorrectly, as the notch prevents you to position the module backward and if it is not fully inserted in the socket the holes prevent you to tilt it. It is however necessary to verify that the clips on each side of the module are correctly snapped so that the module is held firmly. The installation is performed starting from the back socket (slot 1) and by adding the modules progressively. Note that going from a configuration using slots 1 and 3 to a configuration using the four slots requires to remove the memory in slot 3. In other term do not try to install a memory in slot 2 if there is already one in slot 3 as this is not possible. This short paragraph gives information on SIP, SIMM 30 and SIMM 72 modules. 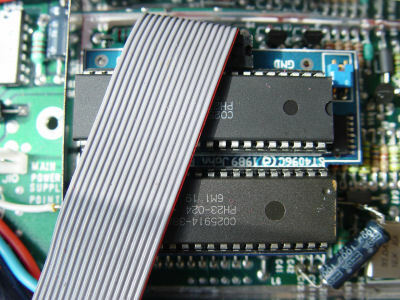 SIP (Single In-Line Package) modules are presented in the form of a board with 30 pins to insert in a receiving connector. These modules have either a capacity of 256 KB, or of 1 MB. Its 30 pins often bent or broke during installation. It has been reported that the SIP modules have been used in early STE models (preproduction?). 8 bits as SIMM (Single In-Line Memory Module) modules (often referred as SIMM 30) are PCB of approximately 8.5 cm in length, on which electronic components are installed (always on only one side of the board). Modules are always installed in group of two often called bank. 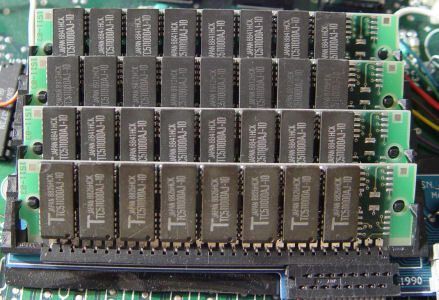 These modules can have a capacity of 256 KB, 1 MB or 4 MB (later 8MB and 16MB were built). Each module has a notch in the left lower corner which is used as a locating pin, thus avoiding to insert backward. The SIMM 30 are the modules to be used on the Atari STE models. 32 bits SIMM modules (often referred as SIMM 72) are PCB of approximately 10.5 cm in length on which electronic components are installed (often on both side of the board). The SIMM 72 modules are available in 1 MB, 2 MB, 4 MB, 8 MB, 16 MB, 32 MB and 64 MB. These modules are especially used with 486 or Pentium PC motherboards. SIMM 72 modules have two notches, a notch in the left lower corner (like the SIMM 30) plus a round notch located in the center of the bar. The SIMM 72 connector has 72 pins on each side, but corresponding pins are connected together. The SIMM 72 modules are not usable for Atari. Certain models of Atari (in particular 520/1040 STF) are equipped with DRAM circuits which are directly soldered onto the motherboard of the computer. This makes the addition of memory extremely difficult. One way of increasing the memory size while limiting the soldering operations is to use a special memory upgrade board which replaces the original banks of memories with SIMM modules installed directly on this upgrade board. It is then possible to upgrade an STF model to a configuration with 1MB, 2MB, or 4MB. Considering the complexity of the operation, the majority of these modules are equipped with 4MB. There were several solutions available like the Marpet Xtra Ram board, the Aixit 10Mb expansion board, or the JRI-RAM+ board. But it is probably extremely difficult to find these boards nowadays. As an example, I provide some details about an Atari 520 STF equipped with one of these upgrade kit. 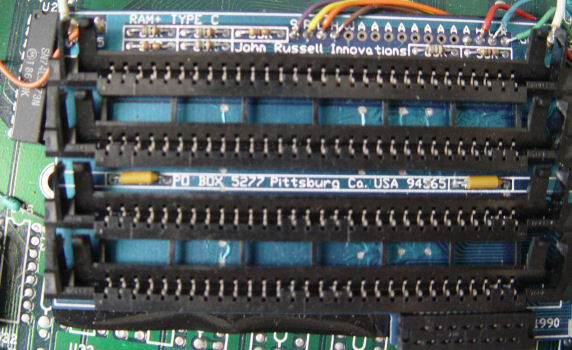 This upgrade kit is composed of two boards developed by “John Russel innovations (Pittsburg CA) and is called the JRI-RAM+. Some more technical information ca be found on this document. This board was installed by B&C Computer (one of the most famous Atari stores in Bay area), because the installation, as you will see, is rather delicate. The main board which receives the SIMM modules must be connected to the power lines (this is the only simple thing), to the data bus, to the address bus, and to several control signals. For that matter, a certain number of individual wires (control signals) are soldered directly on the motherboard. 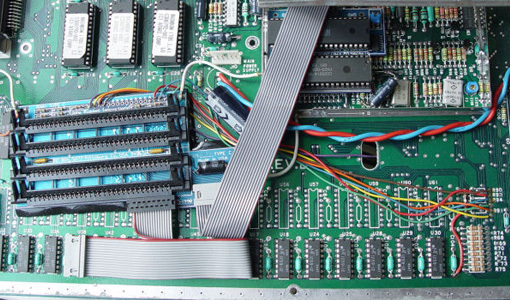 Then, a first bus is connected to the board by soldering a “connector" directly onto one of the original DRAM (see detail picture below). And finally the original Shifter circuit (C025914-38A), which is located in a shielded trap, is removed and replaced by a small board containing 2 Shifter circuits (this provide a 4096 colors pallet to your Atari) and a bus cable that goes to the main memory upgrade board. The complete upgrade in place with the shifter shield trap half-closed. The DIY installation requires a solid electronic knowledge (and access to the schematics of your Atari) and good soldering skill and is surely not recommended the faint hearted! There is also this procedure to add memory to a STF described by Christopher Hicks. The only doubt that I have is that the final configuration is 2,5 Mo which, due to a bug of the TOS, does not work? How do I to know how much memory is installed on my machine and how do I to know if it works correctly? Unfortunately the TOS from Atari does not give any indication on the memory installed and it is thus necessary to use a special program to know about your configuration. There is an excellent program which gives lots of information on the system and in particular on the memory installed. There is also an accessory which gives the size of the remaining memory. In finally this program test the memory installed.